the neat rows of trees. sketch their form against grass. as the grove’s virgin olives. until you hit stone resistance. then spit out the pit. S.A. Leavesley is a poet, fiction writer, journalist and photographer who loves mixing genres and media. Latest poetry publications include How to Grow Matches (Against The Grain Press) and plenty-fish (Nine Arches Press). Website: www.sarah-james.co.uk. Like a lot of my most enjoyable projects, I never intended to make a poetryfilm of ‘And his open mouth is an olive grove’ when I first wrote it in 2015. 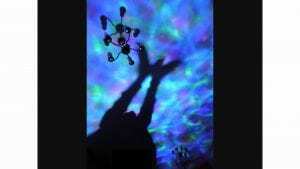 Three years later, someone bought me a colour-changing light projector and I started playing with the shadow patterns. Videoing these, I was struck by the butterfly movement of the two hands, which brought to mind the ‘wafer trace | of a butterfly wing’ in the poem, as well as the general shadows and ‘semaphore of leaves’. But while it was this similarity which made me link the two initially, it’s actually the contrast and differences that convinced me to then combine them in a short poetryfilm. ‘And his open mouth is an olive grove’ is very much about language as a representational system that is both inexact and may be manipulated until it bears little resemblance to reality or true intent. (In this sense, the poetryfilm’s audio might be muted and the visuals alone create a different, but just as valid, version of the same poem.) The textual poem’s main metaphor is the outdoor setting of an olive grove, whereas the video features an indoor scene. Yet the olive grove is itself set within the speaker’s mouth, and in fact words themselves are both everywhere and nowhere in their extensive use yet lack of physical substance. Even the video’s indoor light-fitting resembles branches of fruit, as might be found alongside olives. I chose to mix still images with video footage to mirror the differing qualities of noise and silence in the poem as well as the lines’ natural movement in terms of pause and flow. I wanted this visual aspect to both work with and in tension to the audio, as with slack and pull of meaning. Because I wanted to emphasise the unsettling and inexact elements of language, I also added some extra distortion effects to the still images. 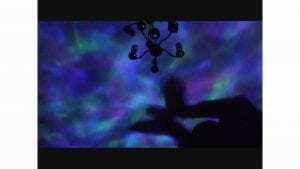 Noticing the underwater quality of the video, I tried to include the hands in a way that suggests both diving into the open mouth (of words) and swimming through all the seductive words. But the very act of doing this alters the shape of these hands. Alternatively though, the hands might also be thought of as physically enacting the shaping of words from thin air. In this poem, the narrator’s awareness and acceptance of the artifice/dance allows protection against and even enjoyment of language’s slipperiness. But this isn’t always the case.